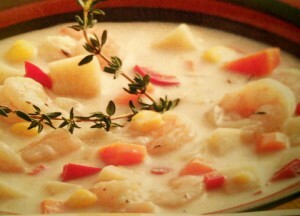 This creamy shrimp chowder recipe from Taste of Home is sure to please the shrimp lovers in your family. You will especially enjoy how easy and quick it is to prepare! 1. Sauté the onion, celery, carrot and red pepper in the butter in a large saucepan until tender, about 5 minutes. 2. Stir in the flour until blended; gradually add the milk. Bring to a boil; cook and stir for 2 minutes or until thickened. 3. Stir in the shrimp, potatoes, vegetable broth, corn, seafood seasoning and thyme. Reduce the heat to low; cover and simmer for 10 minutes or until heated through. Makes 5 cups.